Challenge your child's eye-hand coordination, visual tracking, and logical thinking with the Magnetic Circle Express maze-solving toy. 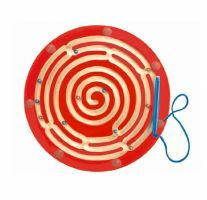 Kids can use the attached magic magnetic wand to move the metallic balls around the maze. Can you get them all to the center? This game is entirely self-contained - pieces will never fall out, never be lost!